Lowe: Which massive Kyrie Irving trade will actually happen? The Cavaliers are projecting confidence they can snare a king's ransom for Kyrie Irving, and more than that, they are acting -- for now -- as if a trade is almost inevitable, and that there is little chance of salvaging their relationship with him, according to several sources familiar with the situation. Things can always change, particularly if Irving initiates a meeting with James to hash things out, but that is the mood around these tense talks now. Irving is not the first sidekick to seek a larger role, or the first superstar to engineer his way out of town. This is the latest version of Carmelo Anthony and Paul George telling their teams, "I will not come back," only Irving is doing it early enough -- with two guaranteed years left on his deal -- for Cleveland to demand a haul. James Harden -- a name Irving's camp has mentioned -- yearned to run his own show, and then chafed when Dwight Howard homed in on his territory. Kobe Bryant famously clashed with Shaquille O'Neal, forcing the Lakers to choose one or the other in the end. Coaches do it, too. Most recently, Dave Joerger essentially got himself fired from Memphis so that he could sign a richer, longer deal in Sacramento. Cavs' best move: Trade Kyrie, trade LeBron or sit tight? What makes this different, and so shocking, is Irving's rejection of LeBron James and the guaranteed championship contention that comes with him. Almost no player has ever rejected winning at that level. Even superstars pay an ego cost to play in June. That is how you win rings. Maybe this is the hubris of a chucker doomed to .500 seasons as a No. 1 option. Maybe Irving is sick of James. LeBron is one of the two or three greatest players ever. He makes everyone around him better. He can also be a glowering, intimidating, biting leader. Some role players -- from Mike Dunleavy to J.J. Hickson -- have quaked under the pressure of pleasing the King. Kevin Love absorbed the glares and rolled eyes and subtweets that came after every blown defensive rotation during the uglier weeks of 2016, held onto some reserve of confidence, and stood to fight in their Game 7 triumph. It was touch and go for a while. Irving adapted well, and reaped the benefits of playing with James: a title, iconic Finals performances, an all-time shot, and marketing fame. The tradeoffs of playing with LeBron are always worth it. Maybe Irving senses James could leave, and does not want his first shot at being a veteran alpha dog to come amid the wrecked remains of a roster tailored for James. LeBron was never the team's GM, as the world joked. But every decision was about him -- about the leverage he held on short-term deals, his win-now timetable that rendered draft picks meaningless, finding players that fit him best. Whether Irving liked it or not, LeBron's greatness merits such organizational fealty. Stable franchises tamp down these kinds of ego conflicts. You have meetings, massage some personalities, tweak the playbook, win a bunch of games, and everyone feels better. You empower the aggrieved, make them feel included. David Griffin, the Cavs' deposed GM, did his best with Irving, James, and Love. Dan Gilbert's inexplicable decision to let Griffin go created a power vacuum at the wrong time. Still: This is an audacious move from Irving. He led the team in shots last season and approached LeBron in scoring. He held the ball longer than James, and touched it almost as often. He was much closer to LeBron in role than to Love. He is a glaring minus on defense, and the Cavs have been horrific when Irving has to play without James. He might be in for a rude awakening now, but that is his choice, provided the Cavs honor his request. They are acting as if they intend to. Cleveland is seeking a bundle of assets, but the highest priority right now is snagging a blue-chip young player, according to sources across the league. That is not necessarily a signal they think James is leaving. They would like to get everything: one or two veterans who can help LeBron dethrone Golden State, that blue-chipper, and picks. They want to prepare for a worst-case scenario of LeBron leaving without shoving him out the door by acquiring players he deems unready. Even so, the blue-chipper appears to be their guidepost, sources say. The Cavs realize DeMarcus Cousins, Jimmy Butler, and Paul George fetched what was considered disappointing return. They know potential targets who signed new deals this summer cannot be traded until December or January. They appear unfazed. Irving is 25, about two and a half years younger than Butler. He has more time left on his deal than George, and carries none of Boogie's baggage. Since Irving made his request privately on July 7, Cleveland's revamped front office under incoming general manager Koby Altman has studied every star trade of the past decade-plus, sources say. They took special note of Phoenix flipping an unhappy Goran Dragic on an expiring contract for two first-round picks, including Miami's unprotected 2021 pick. They are shooting for the mother lode. Most teams, including the asset-rich Celtics, have placed the obligatory call letting Cleveland know they would like to be kept in the loop, sources say. Boston could offer Isaiah Thomas, Jae Crowder and one of their golden picks -- Brooklyn's pick next season, or the Lakers/Kings pick they got from Philly in the Markelle Fultz deal. It's unclear if they would dangle all of that, but those picks could represent the young stud Cleveland needs. Regardless, a deal between the East's two best teams seems unlikely. Everyone wants to swap Irving for Eric Bledsoe, a nice replacement who shares an agent with James. But what else is Phoenix sending? The combination of Jared Dudley, a snug fit around LeBron, and a future first-round pick probably isn't getting it done -- even if the Suns swallow Iman Shumpert. Phoenix isn't tossing in Devin Booker. Josh Jackson could be the swing piece after Phoenix and Cleveland indeed talked around the draft about a swap involving the No. 4 pick, but the Suns were thrilled Jackson landed there. If the Suns relent on Jackson, Cleveland and Phoenix might be able to work a simple two-team deal. Lots of folks have suggested three-team deals in which the Cavaliers end up with both Bledsoe and Official Team Banana Boat Photographer Carmelo Anthony, with Irving going to New York, and Shumpert and Channing Frye flying around to various non-Cleveland participants. It will be hard to make those deals worth Phoenix's while. Perhaps Frank Ntilikina and an unprotected Knicks pick would be enough. But the Suns presumably would like to have at least one or two rotation players of drinking age. That's why the third team in any trade is so often a salary-dumping ground: It is hard to incentivize three teams all trying to win the deal from a talent perspective. Anthony and Bledsoe also make $40.7 million combined, about $4.1 million more than the Irving/Shumpert/Frye trio. That $4.1 million counts almost quadruple for a team as far over the tax line as Cleveland. Lance Thomas would be a tasty side dish in any Melo deal, but he only adds more salary and tax. Miami could save Cleveland money by offering Dragic, Wayne Ellington, and Justise Winslow for Shumpert and Irving, but Cleveland would likely turn up its nose unless the market proves cool. Miami cannot trade any first-round pick that's earlier than its 2023 selection. After two bricky, injury-riddled seasons, Winslow has to play his way back into blue-chip status. LeBron has little use for non-centers who can't shoot. Atlanta has three extra first-round picks, but not the sort of roster talent that would entice Cleveland. You could build some interesting Atlanta-Phoenix-Cleveland mega-deals with Bledsoe going to the Cavs and Irving to Atlanta, but, again, the Suns always come up on the short end unless they have a weird jones for Dennis Schroder. The Bucks could dangle Khris Middleton, Malcolm Brogdon, and two unprotected first-rounders. (Milwaukee might top out at just one). Brogdon and Middleton are switchy defenders who both shot 40 percent from deep last season -- tailor-made for battling the Warriors. Irving would push Giannis Antetokounmpo off the ball, but Antetokounmpo can be effective in that role with Thon Maker spacing the floor at center; imagine an Irving-Antetokounmpo pick-and-roll, with three capable shooters around it. There are too many pitfalls. James needs a second bucket-getter who can break down the defense; Middleton and Brogdon can do a little of that, but not enough over long stretches against elite postseason defenses. The Bucks will always be Antetokounmpo's franchise, and he needs the ball a lot. Is Irving OK with that? He should be. Both guys should be smart enough to lean on each other within a larger system of ball movement. That is what makes Denver such an intriguing partner. The Nuggets put the ball in Nikola Jokic's hands in mid-December, and discovered they had been sitting on the league's most potent offense. The actualized version of Jamal Murray is the perfect point guard to orbit Jokic: cut all over the place for Jokic's sling passes, run zig-zaggy handoffs with him, and space the floor. The current version of Irving is a very different sort of player. He wants the ball. He wants the level of control Jokic enjoys -- and even a level beyond that. There would be a painful adjustment period. But maybe adjustment becomes transformation, which becomes basketball magic. The Cavs have been terrible whenever Irving plays without LeBron. Irving's scoring in those minutes has soared anyway, in part because he never stops shooting. Over the past two seasons, Irving has jacked about 26 shots for every 36 minutes he plays without James, per NBA.com. Only six players have ever topped 25 field-goal attempts per 36 minutes in any season, and only one of them -- Wilt Chamberlain -- did it twice. Even Kobe Bryant never pulled it! Meanwhile, Irving's assist numbers in those minutes barely ticked up. That sample obviously captures Extreme Kyrie. But if that is the sort of player he hungers to be, he will never win big. Nobody wants to play with that guy, especially when that guy gives you very little on defense. Maybe growing alongside a pass-first savant like Jokic is exactly what Irving needs to broaden his game. The Nuggets are building a system around Jokic. The Cavaliers have never really had one, beyond asking James and Irving to do transcendent things. People within the team think that is one reason they flatline when James sits. He is the system. Without him, they just kinda make stuff up until he comes back in. And the Nuggets, desperate to make the playoffs, may need an upgrade at point guard unless Murray is ready for heavy starter minutes. Toss aside the fit issues. Murray is 20. Irving is a superstar offensive player. Tilt his game a little bit more toward passing -- an evolution that might happen naturally with Jokic and Paul Millsap flinging the ball around -- and maybe he becomes one of the league's half-dozen or so best offensive players. He would also sell tickets in market that badly needs a jolt. The price would be steep. Cleveland would likely ask for Wilson Chandler, Gary Harris, Murray, and a first-round pick. Dealing both Harris and Murray would blow a hole in Denver's exciting young core; if Irving signs elsewhere in two years, what do they have left? They would surely fight to keep one, and might even make doing so a deal-breaker. Flipping Chandler, an essential ingredient in any Denver-Cleveland deal, would open a void at small forward. Denver might be able to scramble with Will Barton, Juancho Hernangomez, and a minimum-level free agent like Gerald Henderson or Arron Afflalo. Still: That is a concern for a team hell-bent on making the playoffs. That theoretical Denver package doesn't net LeBron a traditional point guard ready to handle as much of the heavy lifting as Irving has. The Nuggets could rope in Brooklyn for a three-team trade in which Cleveland would receive Jeremy Lin, Chandler, Harris, and a pick -- with the Nets gobbling up unwanted money, including Shumpert, for draft assets. Denver might keep Murray in this scenario, but they'd have to send out picks. There have been no rumblings yet about Lin, or the Nets' participation as a third wheel in any Irving deal, league sources say. The bond between Kenny Atkinson, Brooklyn's coach, and Lin runs deep, and the Nets want to see how D'Angelo Russell looks next to Lin. Finding a third team is essential for Cleveland to acquire another target that makes sense: old friend Andrew Wiggins. Wiggins makes about $11 million less than Irving. Minnesota has no appealing contracts to make the money match, or to send to a third team like Phoenix that could supply Cleveland a point guard (Bledsoe). LeBron may demand a more seasoned veteran along with Wiggins, who has never sniffed the playoffs. Minnesota cannot move Jeff Teague until Dec. 15, which is either an intractable problem or an inconvenience to be waited out. Lin could be the lever that activates three-team deals here, too, with Brooklyn extracting draft picks to absorb Cole Aldrich and perhaps one other small salary. Minnesota has only 11 players under contract, meaning a 3-for-1 deal would leave them with half a roster. Maybe that is Tom Thibodeau's fever dream, so that he can play everyone 40-plus minutes. Philly's level of interest is unclear, but the bet here is that they want to settle in and see what they have. 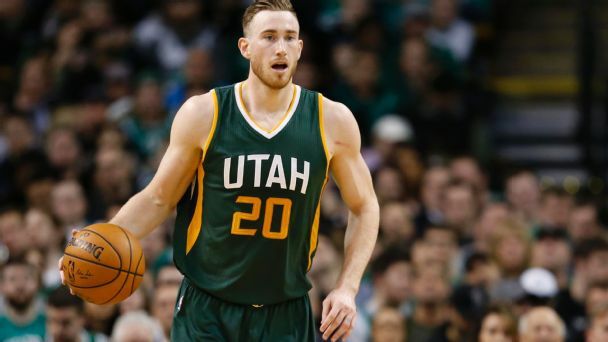 Utah's post-Gordon Hayward roster doesn't offer an easy trade fit. San Antonio's path to a deal is murky. I am perhaps unnaturally intrigued with pairing Irving and Anthony Davis in New Orleans. Davis is almost the ideal co-pilot for a ball-dominant point guard. He's a pick-and-roll dance partner who can isolate and post up when Irving needs a respite, and use the threat of his jump shot to draw defenders out of the lane. He doesn't have the ballhandling to initiate possessions, but puts his mark on them every step of the way. He is basically a first option without all the dribbling -- a trick that convinces Irving the team is his. For this to work, Cleveland would have buy DeMarcus Cousins as a Golden State bully-ball destroyer for LeBron, and a potential centerpiece who would re-sign if LeBron bolts. That leaves a lot to chance. Chicago has nothing (and never really did beyond Jimmy Butler), and the Chris Paul dream is dead. This is a huge decision for the Cavs, and for Altman -- his Masai Ujiri into-the-fire moment. What they get for Irving, if they deal him, could define the course of their franchise for the next half-decade.